We have recently had three enquiries about meeting funder expectations for data from researchers at UEL – one wanting to demonstrate institutional controls on the licenced use of NHS data and two writing Data Management Plans (DMP) for the first time. We have not set up our support service yet – though we have a name at least. And our colleagues in UEL’s research office (which is called Research and Development Services or ReDS for short) have been letting those writing bids about our work. Hence the contact from three researchers. In response we quickly created a DMP at UEL flyer- maybe we will need to refine it when we are properly established as a support service. The first involved looking for policies other than the research data one – information security, our Code of Good Practice in Research, etc. These would reassure the NHS Trust owning the data that it would be managed well within UEL, and that the researcher would be held to account for any breaches. The other two were for research councils (AHRC and MRC): for the first I read through the draft bid and Technical Plan and offered comments on improving the latter, while for the second I read through the draft bid and drafted a DMP using the DMPOnline tool . John and I then met with the researcher to tease out some of the detail, and the DMPonline document was reworked by the researcher for submission with the bid. We will follow up with each researcher and ask how they found the service – even though we are not officially open for business! And we are keen to find ways to share best practice in writing DMPs at UEL. 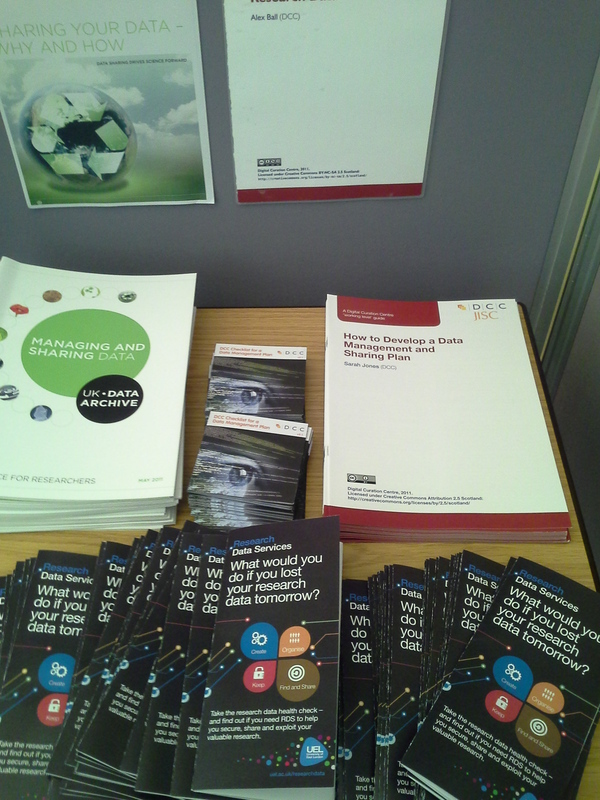 UEL is serious about supporting its researchers in managing their research data. I blogged before that we have funding next academic year to build a support service and infrastructure, and now we have advertised a job too. I am happy to answer informal enquiries – call me (Stephen Grace) on 020 8223 7858 or email me at s.grace [at] uel.ac.uk if you want to know more. 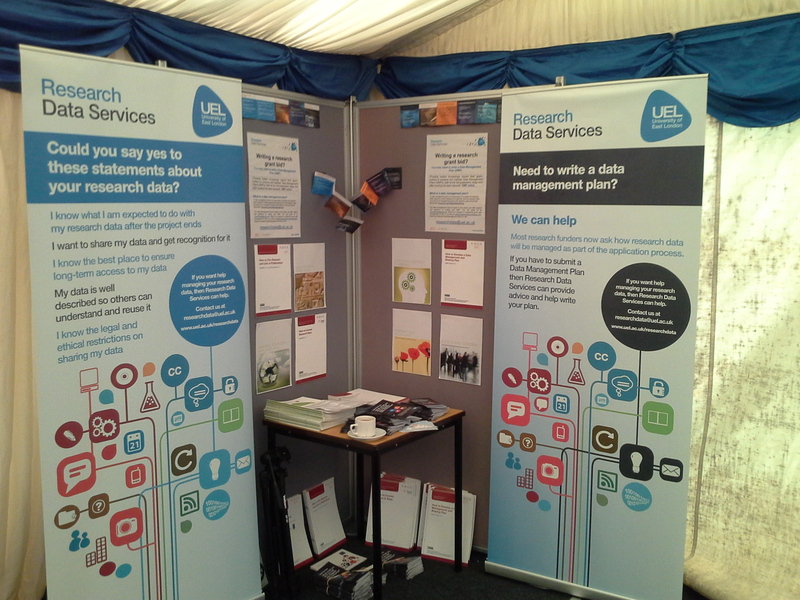 LLS will develop by 1 May 2015 an infrastructure and support service for research data created in consultation with Schools and Services. This will include a portal for datasets which are suitable for sharing. Of course, we will undertake more extensive consultation to know what is wanted by researchers. And we will discover and document what support our colleagues in other central services can offer. I think an RDM website is a priority for the summer, pointing to existing internal support and the wealth of external guidance even ahead of a dedicated service. I will look to see what we can achieve in the TraD project before it ends that adds to the training aspects those of guidance, support and infrastructure. The many outputs of other MRD projects will help greatly here. Our Associate Director Gurdish Sandhu had been advocating for good management of research data since 2009, when she presented the findings of the Keeping Research Data Safe report to the Research and Knowledge Exchange Committee. And our Director Cathy Walsh has been able to argue that Library and Learning Services is able to lead an RDM support service, building on our existing skills and a track record of delivering technology-enabled services with a customer focus.